2001 EP to prelude Sunspot's full length Fallen Angel. Tracks 2 and 5 from Angelz WIT Dirty Faces album. Track 3 from forthcoming Sunspot Jonz album, Fallen Angel. Track 8 produced by Bonez, recorded in Australia. 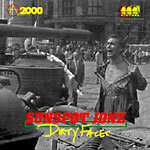 Produced by Sunspot Jonz except 8 by DJ Bonez.